If you have any questions about the 110' FAST PILOTHOUSE information page below please contact us. 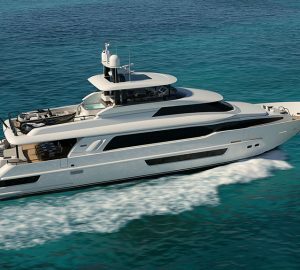 The 110' FAST PILOTHOUSE is a composite luxury yacht first announced by Crescent Custom Yachts at the Fort Lauderdale International Boat Show 2018 with a launch date in 2019. The interiors and exteriors are the work of Gregory C. Marshall with accommodation for up to 8 guests across 4 en-suite cabins. The lower deck swim platform connects to the main deck via two staircases which lead up to the main deck aft where there is a sofa fitted along the stern and a raised table for elegant alfresco meals. On the flybridge, the aft section is reserved for storing the tender while cruising. A Davit crane is on hand for easy launch and retrieval. 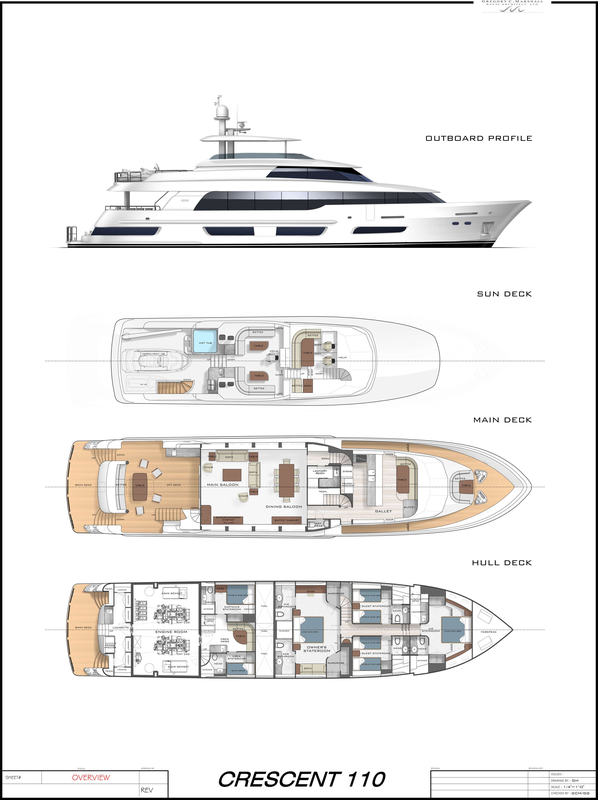 Amidships in the sunshine is a Jacuzzi and the forward section hosts the sheltered hardtop with tinted skylights that provides an area for alfresco dining and lounging. The helm station is placed forward and down on the bow there is a final seating area consisting of a love seat for private drinks while watching the panoramic sunset. On the main deck, the salon is placed aft with the forward galley enjoying 180° panoramic views. The main foyer leads up to the raised pilothouse, which in turn leads through to the flybridge. The accommodation sleeps a maximum of 8 guests over 4 en-suite cabins: 1 Master suite and 3 further guest cabins, all located on the lower deck. We do have available further amenity, owner and price information for the 33.5 m (110') yacht 110' FAST PILOTHOUSE , so please enquire for more information. The luxury yacht 110' FAST PILOTHOUSE displayed on this page is merely informational and she is not necessarily available for yacht charter or for sale, nor is she represented or marketed in anyway by CharterWorld. This web page and the superyacht information contained herein is not contractual. All yacht specifications and informations are displayed in good faith but CharterWorld does not warrant or assume any legal liability or responsibility for the current accuracy, completeness, validity, or usefulness of any superyacht information and/or images displayed. All boat information is subject to change without prior notice and may not be current.